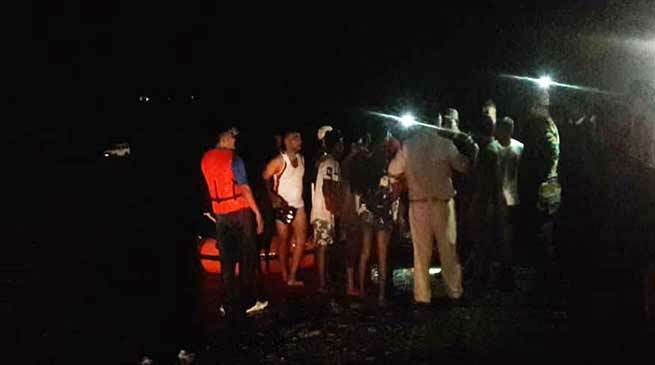 Capital police with the help of SDRF rescued four people who were stranded in Dikrong river. The capital police with the help of SDRF rescued four persons who were stuck in Dikrong river with their vehicle. All four persons have been rescued by their vehicles was on the middle of water till filling of this report. According SP capital and Papum Pare Incharge M Harsha Vardhan, police received the Information a around 07:15 pm that “four persons in a vehicle are stuck in Dikrong river in the area of PS Doimukh”. Police team immediately rushed to the spot, and after seeing the gravity of the situation, SDRF and NDRF teams were called in. After lot of efforts, at 09:10 pm, all 4 persons were rescued by boat, but the vehicle remains stuck over there. Rescued persons have been identified as Samsul Islam, 20 yrs, Toibur Ali, 18 yrs, Abbas Ali, 18 yrs & Mastikul Rehman, 24 yrs. Out of the four persons, two are working in Naharlagun and two in Sagalee. They went to the Saturday market near Dikrong river at about 04:00 pm. They wanted to wash the vehicle and then proceed towards Sagalee. However, they got engulfed in rising waters and got trapped. They informed their relatives over phone who in turn informed Naharlagun fire station. Then the information was passed on to the local police station. Police again cautioned people against entering into the river in Doimukh area. It appears to be shallow but water rises fast.